And that rumour is fuelling some other rumours, if you know what we mean. Meghan Markle and her mother, Doria Ragland, arriving at Cliveden House Hotel in England the night before the royal wedding. Meghan Markle doesn't have a big family, and as we all know, her father probably won't be in the running for world's best parent any time soon. 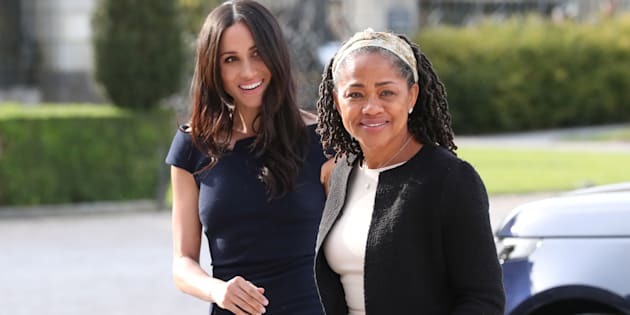 But she's close with her mother, Doria Ragland — and according to reports, the two might get even closer. Depending how trustworthy you find tabloids, there is growing evidence that Ragland is preparing to move to London to be closer to Meghan, her only child. According to Express, she's "beside herself with excitement" about the move, which will reportedly happen next month. "She is getting ready to move to London. I think she will be going as soon as possible," a friend of Ragland's, who of course could not be named, apparently told Express. "She also fell in love with England and told me when she got back that it's somewhere she believes she too could happily live." Another source told the paper that Meghan and her mother are "inseparable." Meghan Markle watches the closing ceremony of the Invictus Games with her mother Doria Ragland in Toronto on Sept. 30, 2017. It's not impossible that a move might be coming: Ragland, 61, quit her job at an L.A. mental health clinic in May. She was a social worker focusing on geriatric patients, and also taught yoga on the side. Doria Ragland with Prince Charles and Camilla, Duchess of Cornwall, at Meghan Markle's wedding to Prince Harry. In an essay published in Glamour last summer, Meghan cited her mother as one of the women who changed her life. She praised her mother's "life-long sensitivity to nurturing and caregiving" as well as her "free spirit." "We can just have so much fun together, and yet, I'll still find so much solace in her support," she wrote. "That duality coexists the same way it would in a best friend."